With a raspy voice and between coughing spells, a tired but excited Taylor McNeel is thankful to God and to all those who invested in her life for the opportunity to serve as the National President of FFA and the organization’s more than 610,000 members. McNeel, a junior Agriculture Business student at Southern Arkansas University, was named Saturday, October 31, 2015, to this prestigious position in front of around 16,000 people at the Kentucky Exposition Center in Louisville at the Future Farmers of America National Convention and Expo. Throughout the convention week, McNeel and the 40 other officer candidates selected from around the country were put through a series of interviews, speeches, workshops, writing assignments and tests. She said the process aims to gauge the candidates’ skills and knowledge of FFA and agriculture, and to find out who they are as people. McNeel made the cut down to 24 on Tuesday, and she said it was an anxious waiting game from Thursday to Saturday until the final results were announced. McNeel may have been physically exhausted from the selection process, but her spirits have never been higher as she was looking forward to the year ahead as National President. 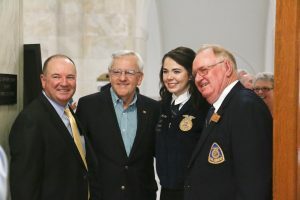 For this role, she has taken a reprieve from her studies at SAU and will travel more than 100,000 miles to meet with as many FFA members as she can. Her main goals are to promote FFA’s organizational mission and agricultural issues. She will communicate with students through speeches, at workshops, and one-on-one at FFA camps and conventions. She will also visit with FFA alumni, sponsors, and agriculture industry representatives. She explained that she has gone through a transformation since she found out she was chosen in January by the Arkansas FFA to be a national candidate. She said she was inspired by Bob Goff’s Love Does to live “palms up” in life and to take what God gives you and give it to others. She said this attitude, along with having openness to everything and a willingness to take every opportunity given to her, has helped her get through this process. Although she has recently had revelations, she is no stranger to success. McNeel came to SAU from her hometown of Vilonia after recently being named President of Arkansas FFA. She proceeded to successfully balance that role’s responsibilities with her classwork. Above that, she gained respect at SAU and earned a coveted spot as a President’s Ambassador. She said that this campus position lends itself to incorporating helping others into her daily life as she gives campus tours and visits with prospective college students and their families. The SAU Foundation is holding McNeel’s scholarship for her to return and complete her degree following her year of service. She has previously been given financial assistance from SAU, which allowed her to complete an unpaid summer internship in Washington, D.C., and to travel to South Africa to learn about that country’s agricultural practices. SAU is equally grateful to have McNeel as an outstanding student representative. “Dreams do come true! The SAU community is so proud of Taylor for this great national honor. She has worked extremely hard to reach this goal. Her selection not only reflects Taylor’s diligence, but what others think about her character,” said SAU President Dr. Trey Berry. McNeel returned to SAU and hit the books to finish her fall semester early and report back for duty by December 1. While in Arkansas, she made appearances at a packed press conference at the Arkansas Capitol. She also spoke at an SAU reception honoring her achievement. After her speech at SAU, she was presented with a new SAU Student Achievement Award by SAU President Dr. Trey Berry, who said this honor will only be bestowed to students who have gone above and beyond as McNeel has done. McNeel grew up on a small family farm. Both of her parents had full-time jobs off the farm, so she became accustomed to being busy from an early age. Her chores tending to 25 head of market goats and the horses taught her the value of hard work. She joined FFA in the ninth grade and had previously attended four national conventions. She said she always looked up to the national officers, but it was not until she became a state officer that she realized it was something in which she would be interested. To find out more about McNeel and why she is happy she chose SAU, visit www.SAUmag.edu/Taylor.